Sony has announced thatgamecompany’s (TGC) new PS3 exclusive game, Journey. Some screenshots and a fact sheet were sent out. What is immediately noticeable is the simple and stark art direction shown in the screens. Personally, I’m really digging it. I’ve also liked TGC’s previous games, with flower being one of my favorite games of 2009, so I’m very interested in seeing Journey in motion and hearing more about it. You will also notice that they mention online play. It sounds like you may be able to wander into other players in the vast expanses found in the game and then you may choose to explore with them or not. This could be very interesting. The fact sheet says it will be coming out in 2011, but hopefully we won’t have to wait too long before we get to see more of this game. The pioneers that brought you the award-winning PlayStation®Network titles flOw & Flower® are back with another title that challenges traditional gaming conventions. With Journey, thatgamecompany (TGC) continues its tradition of delivering simple gameplay and accessible controls in a rich interactive environment that invites players to explore and experience emotional chords that are still uncommon in video games. LUSH AND EXPANSIVE ENVIRONMENTS – Grand landscapes filled with dynamic sand and cloth. Fully simulated sand dunes ripple and slide as players move across them. Infamous 2 has been officially announced with the reveal of next month’s Game Informer cover. The magazine will have a 10 page feature on the sequel to what might be my favorite superhero game. The cover features concept art (seen above), and is surprisingly different than the last game. Sucker Punch has changed the look of Cole, the protagonist of the series. Personally I’m not a huge fan of the new look, but I’ll reserve judgment until I see the actual in-game version of the new Cole. Besides a makeover for Cole, Sucker Punch will also be moving the game to a new city. They also promise new powers and a new foe. This is all good news, as even though I thoroughly enjoyed my time Empire City it wouldn’t be that exciting to go back there for the sequel. New powers and enemies should also keep things fresh. As long as Sucker Punch creates another solid and fun game with a decent story then I think I can look past the new art direction of the sequel. The new issue of Game Informer should give us a nice first look of the game. With E3 only two weeks away, we may also get to see some actual gameplay soon as well. Ok, so earlier today one screenshot (above) of what was said to be Killzone 3 was leaked. It features several Helghast in new winter gear as they appear to be in a snow covered environment. I’m a sucker for snow levels, and just imagining what Guerilla Games could pull off with their Killzone 2 engine has me very excited. However, I wasn’t sure how real this image was. Well, it looks like I was wrong to doubt it. It is real and it seems we are on the brink of an official announcement of Killzone 3. Some scans (seen here) have since been leaked of the upcoming issue of GamePro, which will have a world premier of the game. They show some familiar faces, new places, snow, jet packs, and other assorted awesome-ness. Hopefully this is just the beginning of the information about this game. It is quit possible that journalist have already seen the game, or are going to get a good look at it around E3. I’d also imagine Sony will have an in-game trailer or maybe even gameplay of Killzone 3 during their E3 press conference. Hopefully they aren’t banking on it being in 3D as the major selling point, as I could care less about that. I just want another beautiful action packed FPS with a great setting and atmosphere. I guess this is just one more reason I can’t wait for E3 to come. Last week Capcom released a new trailer (seen above) entitled “Kill Big” for Lost Planet 2. In the trailer you will see a lot of gameplay, a quick look at the available character customization, and the diverse enemies and environments you’ll encounter in the game. From what I’ve read, and seen in the trailers Capcom has released, the game will feature several different factions or groups. Each has their own look, with varying types of gear and mechs. It also seems that the game will be broken into large chapters or episodes. In each of these you will complete several missions and a mini-story as the different factions. All of which should lead to a larger cohesive ending. 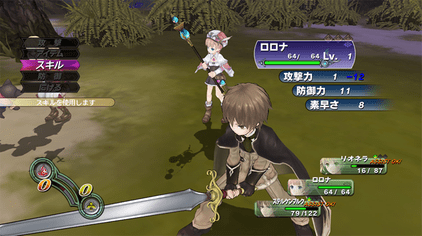 During these episodes you can play alone with 3 AI controlled characters or go online and play through the story with 3 friends. 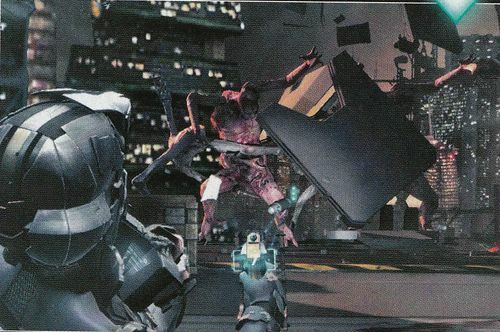 This is probably one of the main draws of Lost Planet 2. Besides the co-op story there is competitive multiplayer. Hopefully the story is long enough to make it and the co-op the main focus, as we have enough multiplayer shooters as it is. It looks like there will be a nice variety in the environments you will battle your way through over the course of the game. There are snow covered areas, jungles, deserts, deserted towns, and even large city like areas. I doubt you’ll end up getting bored, seeing as you’ll be moving to all these different areas and playing as new factions. It also appears that these environments will be stocked with a variety monsters. 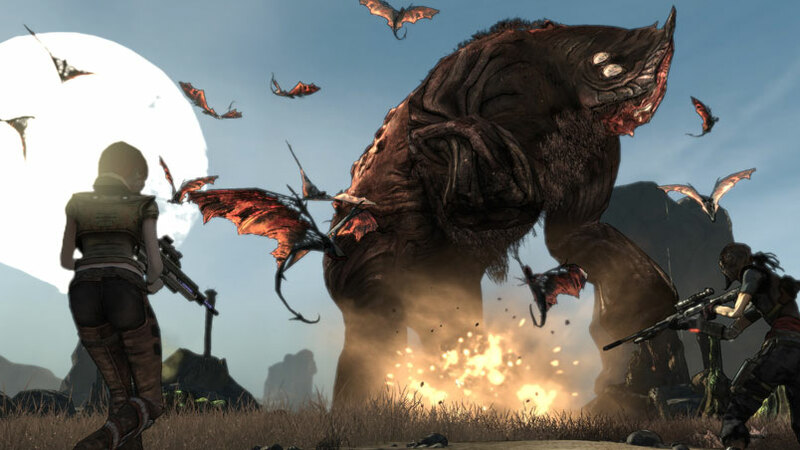 Some are of a more manageable size, but as the trailer shows there will also be some very big monsters to confront. These larger monsters will require some teamwork and strategy to take down. 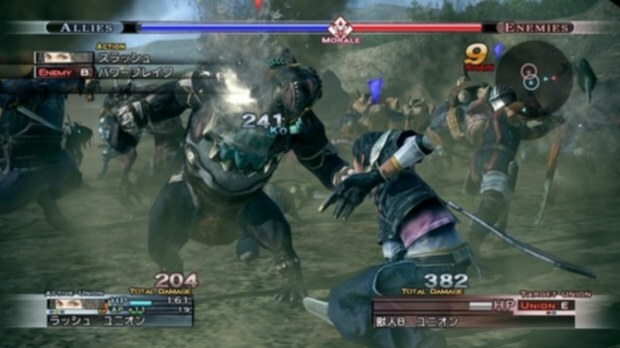 But Capcom has said that you should be able to take the monsters down with different weapons, so you won’t have to worry about being equipped perfectly for each encounter. You will also notice the large amount of customization available in the game in this trailer. It looks like there will be an almost endless amount of character customization. From different types of gear, weapons, and even body types. This has me really interested in the game. 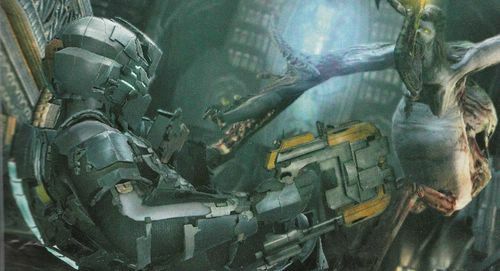 In fact, this along with the 4 player co-op and large monsters is giving me a very big futuristic Monster Hunter vibe. Which is kind of funny, as Capcom switched the development of Monster Hunter 3 from the PS3 to the Wii because they didn’t think it would make enough cash in the West on the PS3. But I guess since Lost Planet is a more gun oriented game they figured it would do well enough in the west to make it on HD consoles. Maybe if Lost Planet 2 does well enough we’ll see another version of the game that moves even closer to the Monster Hunter formula, or even an actual Monster Hunter game come to HD consoles. However, I do have one big problem with Lost Planet 2 and Capcom. Not too long ago Capcom came out said they were having trouble fitting everything they originally wanted into the game. This was due to the limited DVD space that is available to the Xbox 360 version of the game. I was originally pretty upset about this. I mean why should the game have to be shortened, or decreased just to fit onto one outdated disc. Just add another disc to the 360 version. Instead I am sure all this cut content will show up as DLC, and for the PS3 version it could even end up already on the disc with just an unlock key being needed (for a price). This news has almost made me give up on this game, despite it being quit appealing. I’m still unsure if I’ll pick it up, but this new trailer has gone a long way to bringing my interest and desire to play it back to the forefront. Lost Planet 2 will be available in North America on May 18, 2010. Do you like shooting lots of things, finding a lot of things, and hoarding those things until you find better replacements? 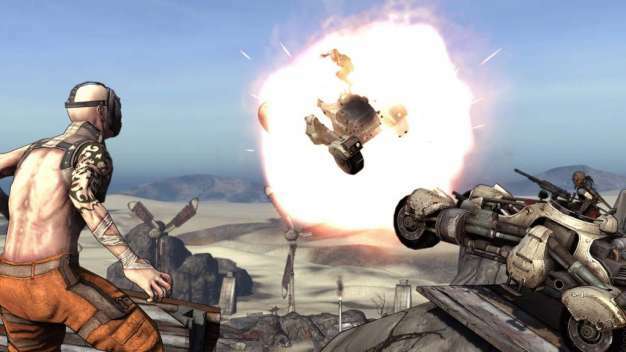 Well, then you will most likely thoroughly enjoy Gearbox’s newest game Borderlands. The first person shooter (FPS) and role playing game (RPG) hybrid with a lot of style and a lot of fun. Welcome to Pandora. Get some guns, rescue some people and robots, kill lots of people and lots of creatures, and collect stuff… I think that sums up the story of Borderlands. I know there is more to it, but the game never really centers on the story. Instead your lust for more loot and new areas is what drives you to progress through Borderlands. The basic story is that you are searching for the legendary vault on the desolate and mostly abandoned planet called Pandora. Pandora has mostly been left to its own devices, after settlers found very little worthwhile on the planet to make any profit from. The only substantial things on Pandora are alien artifacts, ruins, weapons, and the vault. This vault supposedly holds alien technology, artifacts, and good old fashion wealth. However, it only opens every 200 years and everyone that has discovered it has never returned. You are lead through out the games many missions by the “angel”, whom watches over you and tells you how to reach the vault. Besides this angle, you’ll run into several characters that add something to the game besides the missions they provide. However, all of this still plays second fiddle to the actual gameplay and good old fashioned lust for loot. Borderlands is suppose to be a FPS and RPG hybrid, but to be honest it is much more FPS than RPG. So for me, that let me down to a certain extent. However, the smooth shooting controls make the game so fun to play that it doesn’t really matter that the RPG elements are rather lack luster. The story moves you forward in the game, as you are given missions that you have to complete to access new areas of the world and to open even more missions. These missions are what structure the game. You can get them by talking to people, finding things out in the emptiness of Pandora, or from several job bulletin boards. In general the missions are varied enough to keep you occupied enough to seek them out and finish them. You’ll want to complete them in order to level up so you can use some of the higher end weapons. Basically, it is all in service of you shooting, killing, and looking for more loot. Besides gaining experience for your level you can also grow your character in two other ways. When you use weapons you gain proficiency in that weapon class. So the more you use a type of weapon the better you become at using said weapon class. This adds some small bonuses, like increasing accuracy and so on. I found myself using about 3 different types of weapons, and then forcing myself to use the other types just level them up some for missions where they would become very useful for. The skill tree is the other way to customize and grow your character. This is probably the most recognizable RPG element of the game. You select different skills with points you ear as you level up. After dumping enough of them into any one skill another skill on that path will open up. 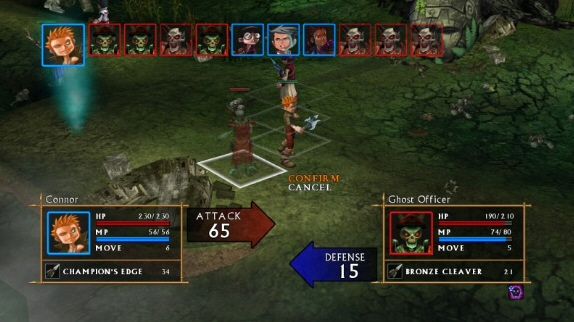 It sounds like a familiar and useful RPG mechanic, but it sadly falls short. I barely felt any difference in how I specialized my characters. In general, these skills didn’t change how I played the game or how my characters felt. If they had more notable effects on your character I think that would have been better. Speaking of characters, you have to choose from one of four characters at the start of the game. These characters are basically different classes. You can be a hunter (sniper/scout), a soldier (generalist among the group), Brick (melee/tank/berserker), and a Siren (has a magical phase ability). You start out with different equipment for each character and at the beginning of the game you’ll play towards their strengths. However, as you progress once again I found myself feeling that all the classes generally blend into however I played. Since you can use whatever guns you want, you can make any of them good at whatever weapon you like using. This is probably good, as you wouldn’t want to be stuck with a limited arsenal or even worse get stuck at a part of the game because your class wasn’t really suited to the mission. At first I didn’t really like how you can’t upgrade your weapons, but since there is a steady stream of new guns and equipment I eventually got over it. However, I always found myself wishing I had more storage space. In Fallout 3 you could get your own place where you could store a ton of stuff. There should have been some kind of storage system in this game when it released. There is now a bank where you can store stuff, but you need to buy a $10 DLC pack to access it. That is just feels really wrong to me. 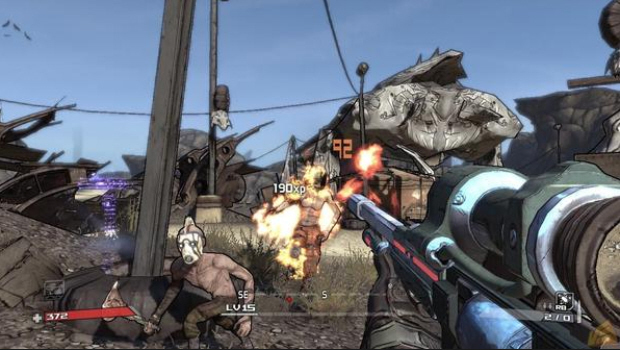 Gearbox claims that Borderlands has some insane number of guns. It does have a ton of them, but they fall into a few categories just with differences in stats and special characteristics. Some add fire damage, poison, shock, explosions, higher percentage for critical hits, damage multipliers, unlimited ammo, and so on. You will reach a point where you barely find any new guns that are better than what you currently have. This became a little disappointing. Once again, I think a better system would have been to allow actual customization of your guns. Allowing the player to mix and match parts, modifiers, and abilities would add a great depth to the weapons. It would also feed into the great loot whoring aspect of Borderlands. The online aspects of Borderlands are pretty much identical to the single player experience with a few differences. 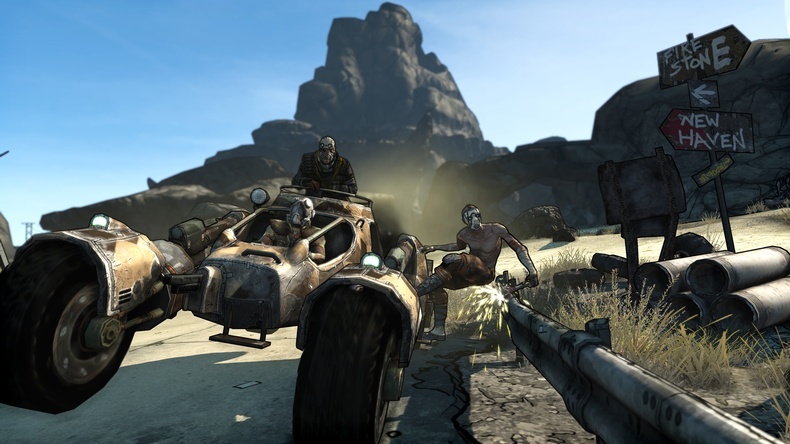 Probably the co-op, both online and local, portion of the game is what most people that want some multiplayer action from Borderlands will play. This allows you to jump in and out of a players game to play along side them. The missions and objectives don’t change, but the amount of enemies and loot does change. With more enemies comes more loot. Also, the game will try to find a balance for the level of the enemies which could lead to better loot if you are a lower level than another player. There are some other multiplayer options, but they aren’t all that deep or too much fun in my opinion. These other options are variations of Player versus Player action. At any point of the game you can trade melee attacks and go into a in-pomp-to duel with another player. Normally your fire doesn’t hurt your teammates but once you’ve engaged in a duel it does. A bubble will pop up around the two that are dueling and remain there until one is victorious. Players not engaged in the duel can’t effect the dueling players. The other PVP option is to enter arenas. In this arenas you can go play 1 on 1 or 2 on 2 against other players. Once again you are in a closed off area and play until you kill each other. You can have it set for different amount of rounds for each arena battle. So it could be best out of 3 wins. Once your rounds are over you warp back out of the actual arena and can either set up a new match of leave and continue gunning your way across Pandora. Overall I think being able to play through the whole campaign in Borderlands is a good idea and great fun for those that enjoy multiplayer. For me, I mainly enjoy single player so it doesn’t add much to the game personally but I can see why other people would really enjoy it. Hell, there are a lot of hours in this game so being able to share some or all of them with a friend is a nice thing. Borderlands is a highly addictive game, but there are some flaws that hold the game back from being great. The game play and overall presentation are very strong. However, you will notice some graphical problems. The art direction wouldn’t make you think Borderlands runs on the Unreal Engine (UE), but as soon as you see the slow texture load times and framerate issues you will immediately suspect that the UE is under the hood. The textures take a significant time to load when you access a new area . You will also notice ground vegetation pop up, almost like it is rapidly growing as you approach it. This mainly happens when you load a new area or are moving quickly through an area (running or driving). The framerate will dip when there are a lot of enemies on screen, especially if they are all close to you. This problem also occurs during multiplayer as well. Both of these things are not game breaking, but disappointing and annoying. The graphical and engine problems are not my main complaint about the game, the story, characters, very light RPG elements, and overall blending of everything are. I found myself not caring about finding the vault, my character, or most of the other characters that populate Pandora. They take a page out of Bioshock’s book and try to add more back story through logs you can collect around the world. To me it felt like they were trying too hard with these, and they didn’t really draw me into the game anymore. And for all the supposed RPG elements, it never really feels like one. Yes, you gain experience, level up, and there are skill trees. However, these elements don’t really make your characters feel all that different. Like I’ve said earlier in this review, the loot and gameplay are the real stars of the game. I generally enjoyed exploring Pandora in search for more things to shoot and more things to collect. However, the repeating enemy types is somewhat disappointing. I really wish there were more types of enemies and more variation in the game. Towards the end of the game you finally get into some truly different locations, but it is only the end of the game. If there was more variation in both the environments and enemies it would have made it feel more fresh. Also, the final boss was very disappointing. Overall I thoroughly enjoyed my time with Borderlands, but I came away wanting more from it. There is a great base here, but the lack of variety in almost all aspects of the game gave me an impression of a not totally realized game. I know I probably sound like I am nit-picking this game to death, but that’s because I can see what Gearbox was going for and hopefully where they will go in a sequel. If you are wondering whether or not you should get this game, it comes down to one simple question. Do you like loot? If so, there is no reason not to buy this game. If you aren’t that driven by the lust for new weapons, well then you might find yourself let down by Borderlands but I’d still urge you to check it out as it is a very fun game. 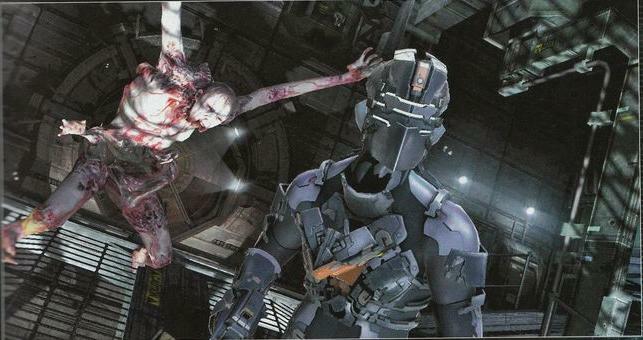 Recently EA released several new screenshots of Dead Space 2, and it is looking great so far. 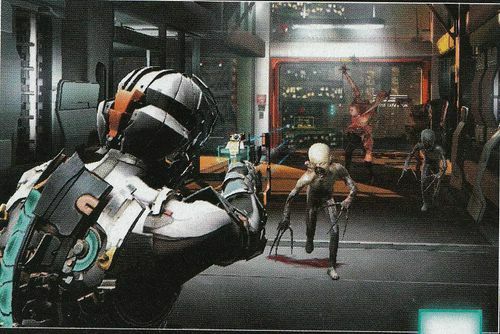 They feature a slimmed down Isaac Clarke, a bunch of necromorphs, and some of the locations you will visit in Dead Space 2. 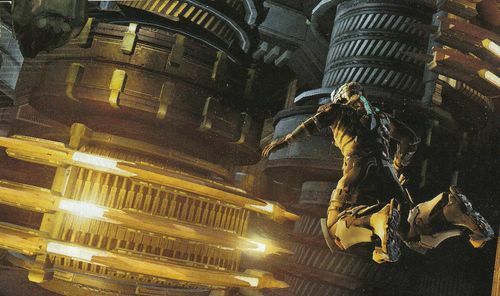 Isaac’s slimed down suit looks a lot more agile than his previous suits in Dead Space. Maybe this is suppose to compliment the new direction on the sequel. Supposedly Isaac is actually looking to take the fight to the necromorphs this time, so the suit could be more than just an engineer’s rig like last time. However, like the last game he is still using the oh so enjoyable and effective Plasma Cutter from the first game. They could be showing off this weapon since it is familiar and they might want to keep more of the new weapons secret until much closer to the games release date. Doesn’t really matter, as the Plasma Cutter was a great weapon and once you upgraded it was perfectly suited at dissecting necromorphs. Speaking of necromorphs, the new screens show off more of the creepy child like necromorphs, some returning necromorphs, and what appears to be a rather large new type of necromorph. You know it is going to take a fair amount of well placed shots to take those guys down. 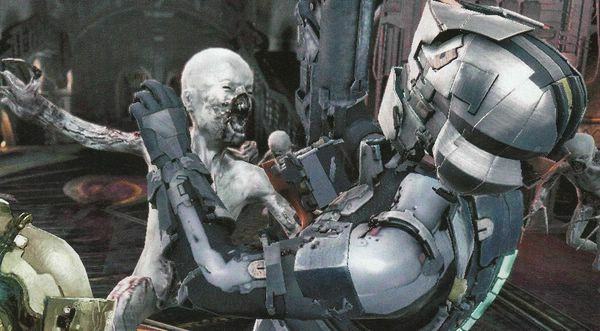 From the screens it looks like Dead Space 2 is shaping up to be a worthy sequel to its predecessor. Ok, so I’m a little late with this but that doesn’t change how cool this news is. One of the Wii’s more interesting games is now getting a HD make over. Suda51’s and Grasshopper’s No More Heroes is getting ported to the PlayStation 3 and Xbox 360 under the new moniker No More Heroes: Heroes Paradise. The game will be pretty much the same game as the Wii version, just with better visuals for your HD tv. The port will also be getting a new mode that makes the female characters wear even less clothing, or that’s at least how I understand it at this point in time. Oh, and it will also be sans motion controls. That might surprise some people, but seeing how the game is launching on February 25th, 2010 in Japan it really shouldn’t since neither Sony’s or Microsoft’s motion control systems will be available by then. I’m not really sold on the whole motion control idea anyway, so this is good news to me. Hopefully someone will decide to bring it outside of Japan as Ubisoft won’t be publishing this game like they did with the original No More Heroes. Maybe lackluster sales on the Wii is behind that decision, but more than likely it will make its way over here (fingers crossed). If you don’t have a heart of stone then Critter Crunch should immediately endear itself to you. With an absorbent amount of character and gorgeous hand draw graphics Capybara Games’ (Capy) first PSN release is easily one of the most fun and challenging puzzle game I’ve played in years. For a puzzle game, Critter Crunch has a great story. Like the game itself, it is pretty simple but has a lot to offer. You play the game as the main character Biggsliocaucus or Biggs for short. Biggs is a medium sized round mammal with no arms and a very long and sticky tongue. Despite being the main character, the game is actually told by naturalist and explorer Hank Hudson whom is visiting the island of Krunchatoa for research on Biggs and to film his tv show. Hank Hudson gives us all the pertinent information about what Biggs is, why he is crunching critters, eating gems, and barfing into his son’s mouth. Hudson will also explain to you the island and give info on new types of critters. The story follows Biggs’ adventure across the island he calls home. Even though the cut scenes that feature Hudson lack voice work, it still manages to add a lot of character to the game and has a ton of charm. It makes the game feel like it is more than just a puzzle game. I could easily see these characters returning in another type of game, featuring the adorably cute Biggs as the main protagonist once again. Critter Crunch consists of several modes, but it would be wise to play the Adventure mode first as it acts as a tutorial and also delivers the games humorous story. In Adventure mode players will move between 22 locations on the world map. Each of these location offers several different levels. They range from Adventures that tell the story and introduce new game mechanics, Puzzle levels in which you have to clear the level with a limited number of turns, and Challenges that vary from time limits, only crunch specific critters, and so on. You have to beat three of any of these levels to get access to the next stop on the map. The game starts off easy enough in Adventure mode, but as you progress you come up against some seriously hard levels. You play as Biggs, who uses his long sticky tongue to feed smaller critters to larger critters. This is the food chain mechanic of Critter Crunch which sets it apart from other puzzle games. When these critters get too full they pop and drop gems which Bigs eats. If the critter that pops is touching another critter of the same type and color it will also pop. So you an string together chains of critters which produce larger gems that in turn fills your hunger bar. If you manage to create a chain that is 8 critters long then Bigs’ son Smalls will appear on one side of the screen. He will open his mouth and beg for food, so being a good father Bigs will oblige if you move him next to Smalls and press the circle button. Bigs will then produce the most lovely rainbow colored barf stream you have ever seen, which unless you live one crazy life I’m pretty sure you haven’t seen too many streams of rainbow barf in your life. Anyway, this gives you a lot of bonus points. However, your barf isn’t only coveted by Smalls. The critters are also drawn to the full spectrum regurgitation. When you are barfing into Smalls’ mouth the critters will move down the vines faster. You have to balance feeding Smalls and watching the critters or else they will reach the bottom the vines and it is game over. If you fill up your hunger bar the level is complete. Food chains and barfing aren’t the only gameplay mechanics in Critter Crunch. There are a bunch of fun and funny power ups to aid Biggs in his quest to crunch across the island. The power ups, or power foods, are obtained by popping certain critters. The power ups come in a variety of flavors. Such as watermelon seeds, peppers, spray paint, and more. Each one does something different and can really save you in a jam or help you get massive chains. These are introduced over the course of the Adventure mode levels, and become more important as you progress through Adventure mode. You will also be introduced to new types of critters as you move across the island. These new types of critters will drastically change the way you play the game. They can be inedible critters made of stone, bombs which blow up everything around them when feed two critters of any type, vegetarian critters which won’t eat other critters, toxic critters, and so on. These additions really make the game’s difficulty rev up towards the end of the game. They also keep things feeling fresh through out your long adventure with Biggs. There is also one other mode that is not available in Adventure mode, Survival mode. Survival mode is a pretty straight forward mode where your object is to… well, survive. You want to survive as long as you can. This is fun and can get quit hectic. In my opinion it is a lot of fun to play this mode in co-op, but I’ll touch on that later. At the end of any of level you get a score which will then rank you on the leader boards. if you are connected to the PSN. Besides your overall ranking you can also can compare just among your friends, which should probably make you feel not as bad if your ranked somewhere in the thousands. Also, if you fail a level you will be treated to a hint or tip. However, pretty much all of these won’t be actual tips for the game. Instead they will humorous messages that should at least get a smile out of you if not an actual laugh. I found this addition to the game to be great. If humor is done right in a game, it really adds a lot to the overall game. For those that feel the need to crunch with friends, Capy has added two multiplayer modes. You can either play with or against people online or local as well . When playing co-op you are on the same team and try to last as long as you possibly can in Survival mode. If you are playing against another player then your goal is to last longer than your opponent. If you fill up your hunger bar it will add another row of critters to your opponent, putting more pressure on them. You can also get new power ups that are only available in competitive multiplayer which will affect your opponent instead of just you. These will also change as you rank up. Both modes are fun, and even more so when played local instead of online but that could just be my preference. Critter Crunch has quickly become one of my favorite PSN games to date. With a plethora of character, humor, and good looks it is sure to charm the pants right off of you. Besides being a charmer, Capy has managed to make a truly deep and enjoyable puzzle game. I’ve kind of been burned out on puzzle games for a long time now, but Critter Crunch has made me a born-again puzzle game fan. I can’t really say enough about how cohesive the stunning art direction and graphics are, the amazing hand drawn animation, lovable characters, and top notch gameplay that makes up this games. It is the total package, and severely under priced for how much content and care has gone into the game. Hell, it is so good that I even stopped playing Uncharted 2 and Demon’s Souls just to spend more time with Biggs. 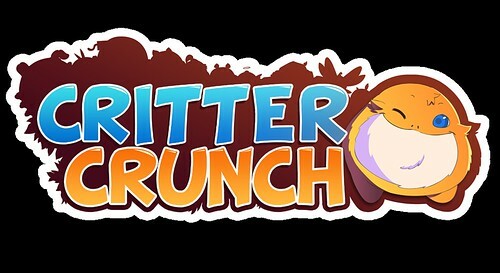 If you are new to puzzle games, or even a hardened veteran of the genre, you should try out Critter Crunch as I am sure it will work its magic and find a place in your gaming heart for a long time to come.